I received a copy of this book for review, but was not compensated financially in any way. The opinions expressed are my own and are based solely on my experiences while reading this book. This post contains affiliate links. Pamper yourself from head to toe with step-by-step instructions guaranteed to make you look and feel gorgeous. Learn how to make your own cleansers, creams, soaps, body butters, shampoos, scrubs, and more, using natural ingredients that are safe and gentle on your skin. One of my goals this year was to learn more about essential oils and how to use them in my home. I’ve dabbled a little with them so far, but have big plans of how I want to use them. 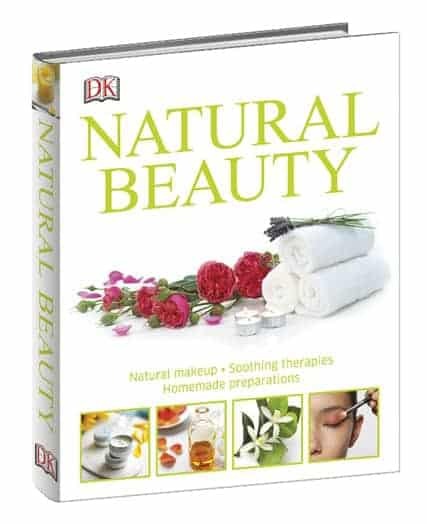 I recently received a copy of DK Publishing’s Natural Beauty and this book’s release couldn’t have come at a better time! It was exactly what I was looking for and showed me all the natural beauty products I can make, many including essential oils! The book opens with a Directory of Ingredients featuring the various types of natural products that you can include in your DIY beauty products. There were a couple listed in there I hadn’t heard of before and am now intrigued to try out. The first section is all about your face. It has recipes for cleansers, toners, scrubs, lip balms, eye masks and more. I really want to try the Frankincense Toner. Frankincense has worked wonders on my skin so far. Other sections include recipes for your body, hair and hands and feet. I’ve made a shopping list of materials I need to buy so I can start whipping up a few of these recipes! If they turn out ok, I may give some as gifts to my mom and sisters. They enjoy natural beauty products. If you are just a beginner in the world of natural beauty products, this book is an excellent start. I can’t wait to just dive in and try some of these simple beauty recipes! Pick up a copy of Natural Beauty on Amazon.com, Amazon.ca or Indigo! I have a friend that started selling essential oils so I have gained interest. What a great book to help me! DK publishing books are always informative and fun to read. Thanks. This book would be great to add to my library.